25th April - Positively bursting with anticipation! Everywhere you look right now something is just poised to happen! 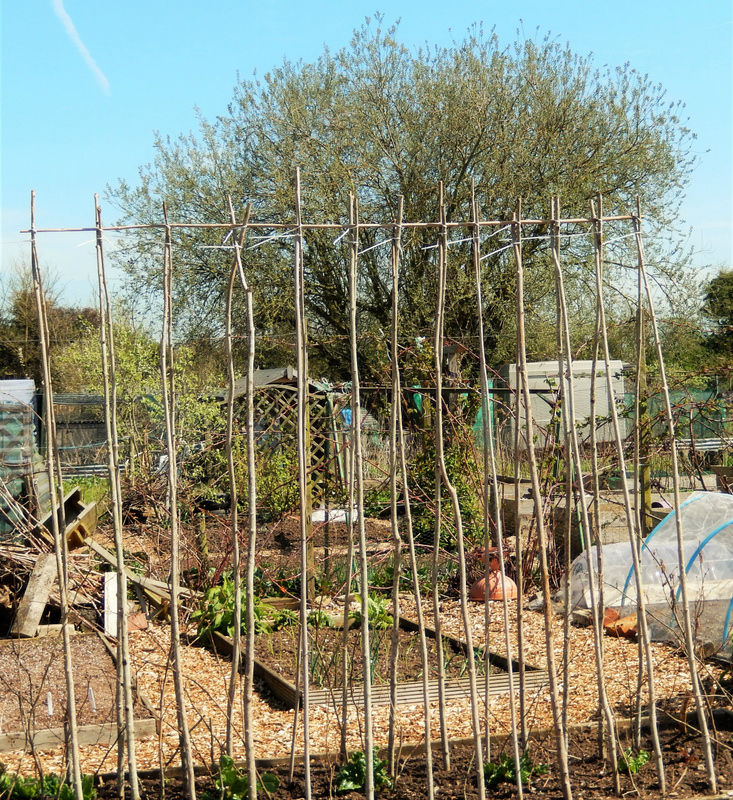 The bean poles - lovely ash ones I bought a few years ago at a local " Bean Pole Day" - are up on #146, and #145 now sports a bedful of pea sticks, as well as wigwams for the drying beans. What did we do before cable ties? With the help of these little zippy plastic strips, we have really solid structures that should stand up to Summer gales even when covered with foliage. Much quicker than using string, too. I have moved the archway for the borlotti beans over to its new position. It looked great last year with the red spotched pods hanging down at head height, so I am hoping for a repeat performance this Summer.The pea plants are almost ready to go out: can't wait to see them in their new home! Champion of England, Telefono, Stokesley and Sutton's Purple Podded are the tall ones, with Parsley Pea and Hatif d'Annonay are the shorter varieties. Bijou mangetout have now germinated. No idea why they are called bijou as the pods are absolutely huge! Must have been as a joke, I suppose. All the climbing bean seeds are sorted, carefully counted out and will be sown in modules tomorrow ... I am not feeding the local rodents with those big juicy seeds!! When all the plants go in thei places, it will be a bit like instant gardening. 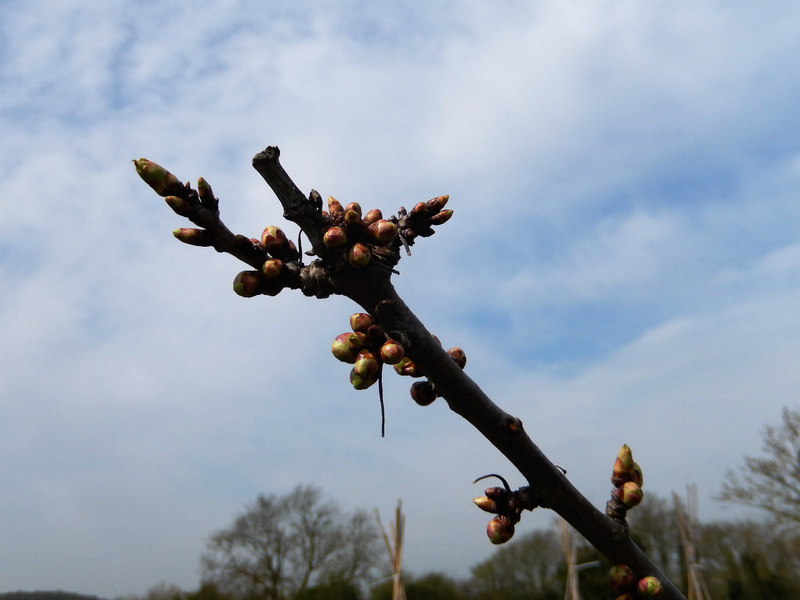 The fruit bushes and trees are covered with opening buds. 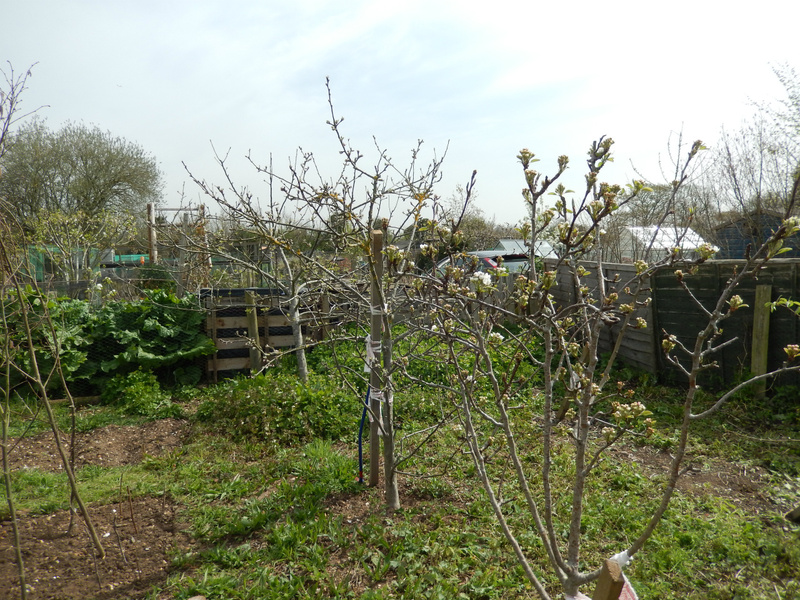 Well, not the two new pear trees as they are a bit young to flower this year, but all the others, including the tiny little Golden Delicious apple tree planted last year, are showing bud colour now. Apparently the delay in their flowering means more liklihood of insects around to pollinate them. If the number of bees on and around our plots is anything to go by, this may well be true. Let's hope so! We seem to have a population explosion of small reddish coloured mason bees, which have made burrows in the sides of the potato ridges. I felt quite guilty this morning when I was earthing up the shoots to protect them from the frosts forecast, as lots of the tunnel mouths were also covered over. I hope they can find their way back in again! With the apple trees I always seem to leave too many fruits for them to grow to full size. I thought I had been much stricter in thinning them down last year, but it seemed not hard hearted enough, so this year I shall be out with the scissors come June! Fewer but larger fruit is what I am aiming for. Even the potato ridges and little onion shoots seem full of promise, and now that the grass (read weeds really!) are strimmed down the little orchard looks so much more spacious and organised. Dahlias are all planted, and flower seeds sown: Calendula, Candytuft, Phacaelia, and a packet of mixed annuals. Lots to look forward to! 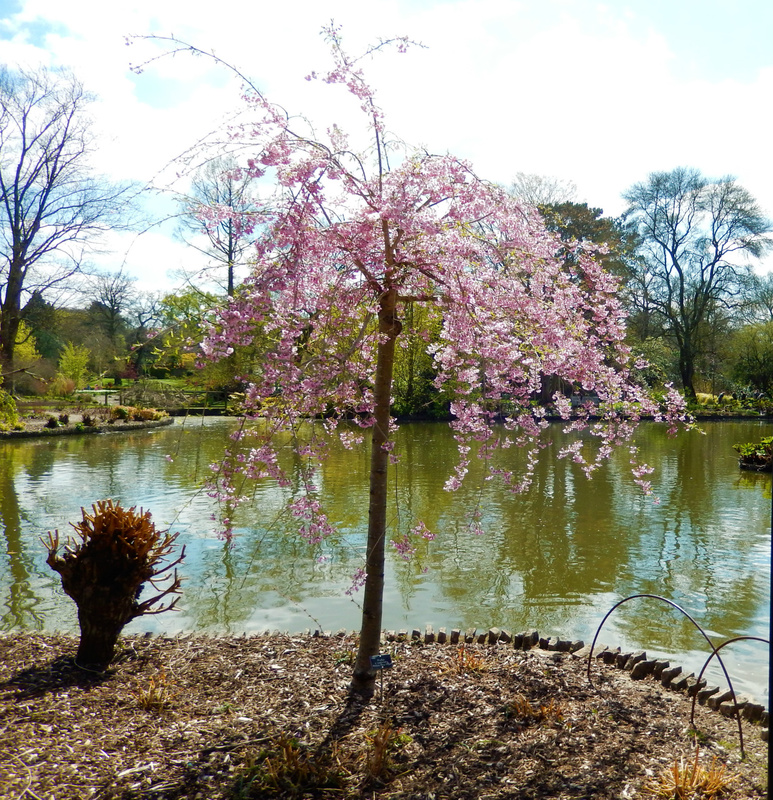 I had a lovely day out in the week, meeting up with my blog-friend Beryl of www.mudandgluts.com and we looked around Wisley with just a touch of envy... fruit tree envy! There are so many very mature and well shaped/ trained trees there it is hard not to look at them with longing. The reality is of course is that I haven't the space or situation to house such beauties, although Beryl seemed optimistic that she could train some up on her plot. That would be wondeful for her. Ours are more the "free form" style, so I shall appreciate what we do have and try not to hanker after what is not going to happen here! It was good to meet face to face with someone I have "known" virtually for nearly four years, and we plan another visit to Wisely nearer harvest time! It was heartenng for both of us to see their Vegetable gGarden was at the the same sort of stage as both of ours are right now. I did notice though that my huge rhubarb plants did not seem to be represented amongst their numerous varieties, so I really must track down what it is. 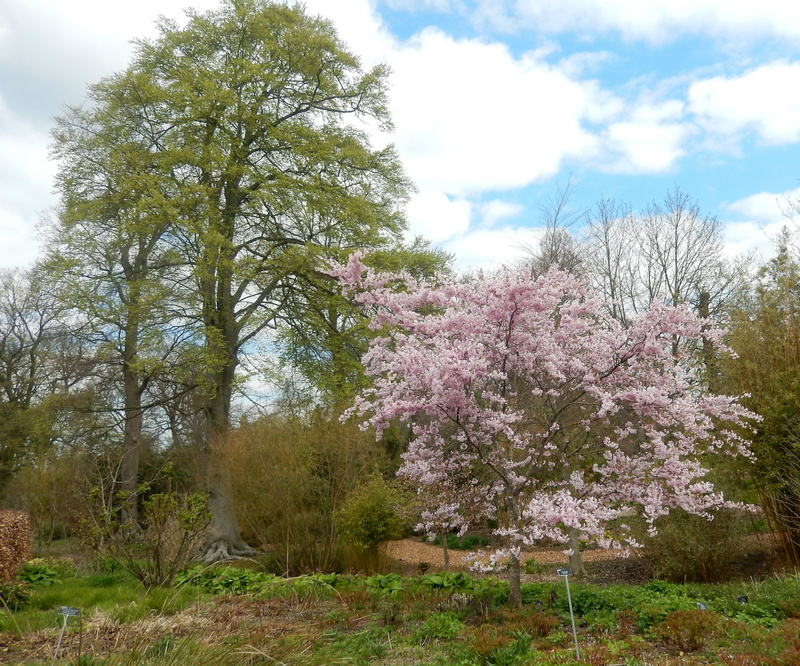 It is well over a metre tall already, and I had hoped to be able to identify it at Wisley, but... not yet! 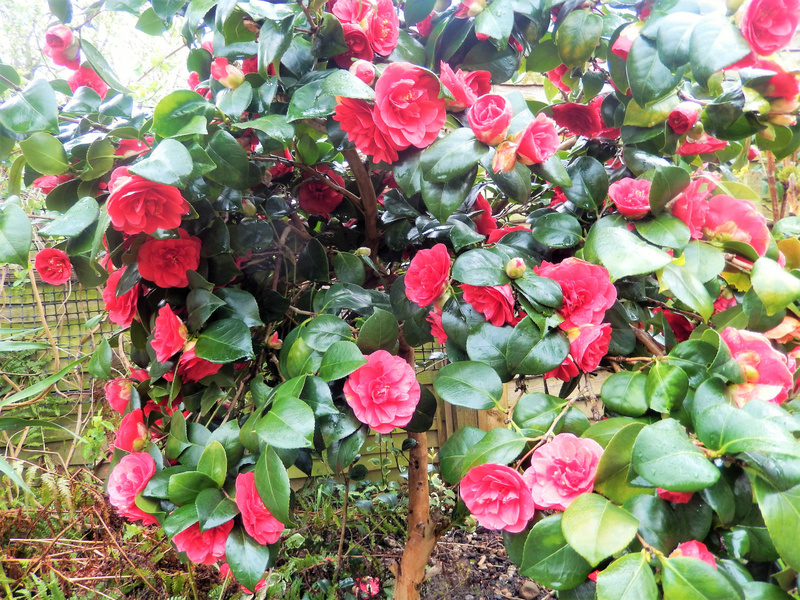 It is from my Dad's garden, and my brother and I have worked out it was at least forty five years old when we moved it to the plot six year ago. It is certainly not lacking in vigour! 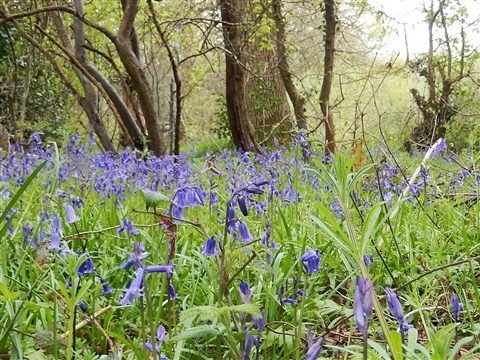 Bluebells - You can see from my lead photo this week that the bluebells are out in glorious swathes through the woods. Lots at Wisely too. When we were children, we would pick great armfuls to take home for vases, but nowadays that would be frowned upon with a BIG frown. They grew alongside the wild garlic, which my Mum hated the smell of with a passion. My brother and I used to try to avoid walking on the leaves, but their smell filled the woods nonetheless. 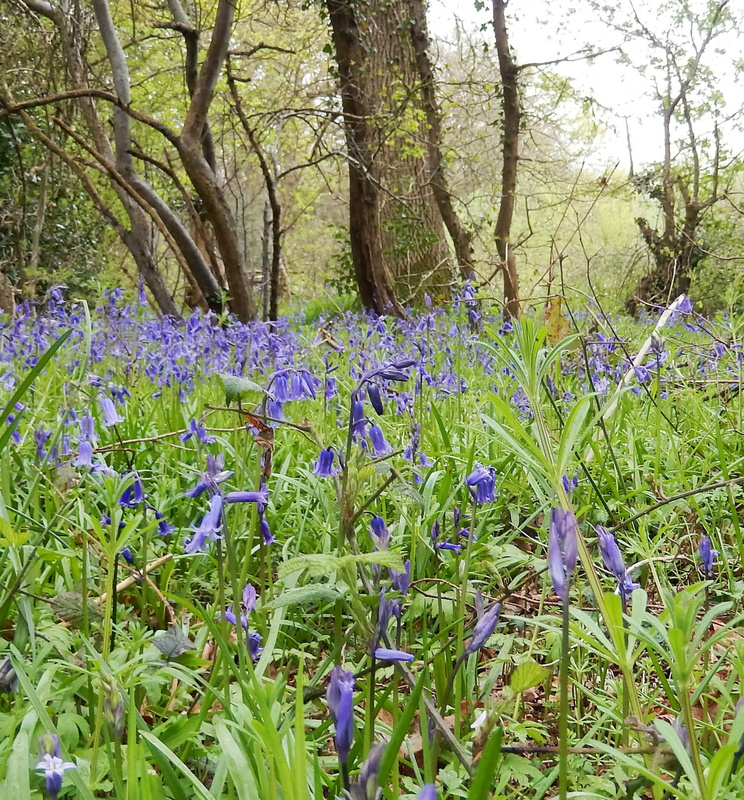 It was only on the way home that the scent of the bluebells themselves was evident, and it is still a smell I love today. I also do like the smell of wild garlic, and the taste too! 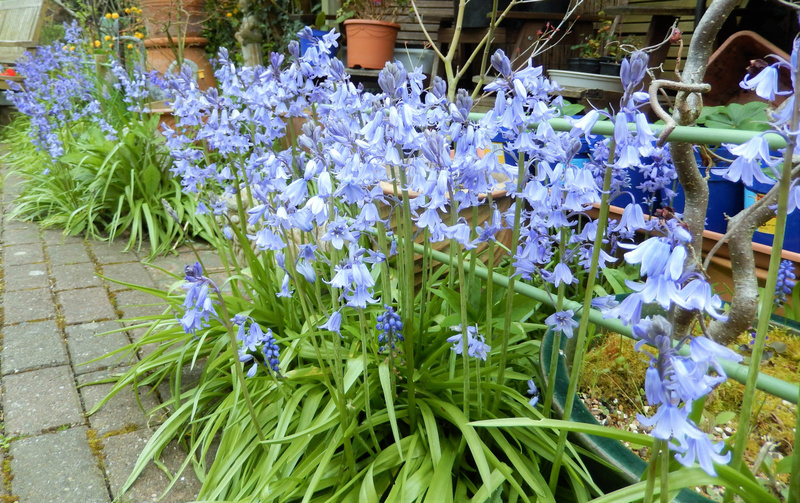 Spanish bluebells have escaped from our gardens, and received wisdom is that they will hybridise with our English Bluebell, which may then lead to its demise. 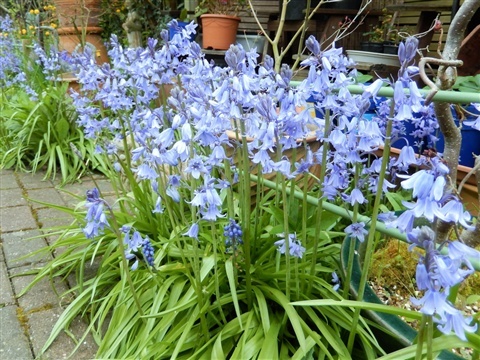 I have to say the Spanish bluebells in our garden here are beautiful, and give us a glorious display every year, even though we dig out bulbs by the handful to thin them down. They are a bit thuggish with their great thick leaves smothering anything else trying to grow near them, and they do lack that glorious scent. There is a lot of information on line about how to tell the difference between the two, but usually it is quite easy when you see the two side by side. I expect there are some hybrids which have some characteristics of each, but as far as I can see the flowers in the woods in this area look like the real deal. Long may that last! This is just my personal view, and I am not suggesting that our native plants are in no danger, only that it does not seem as devastating as it seemed it might be, thank goodness. 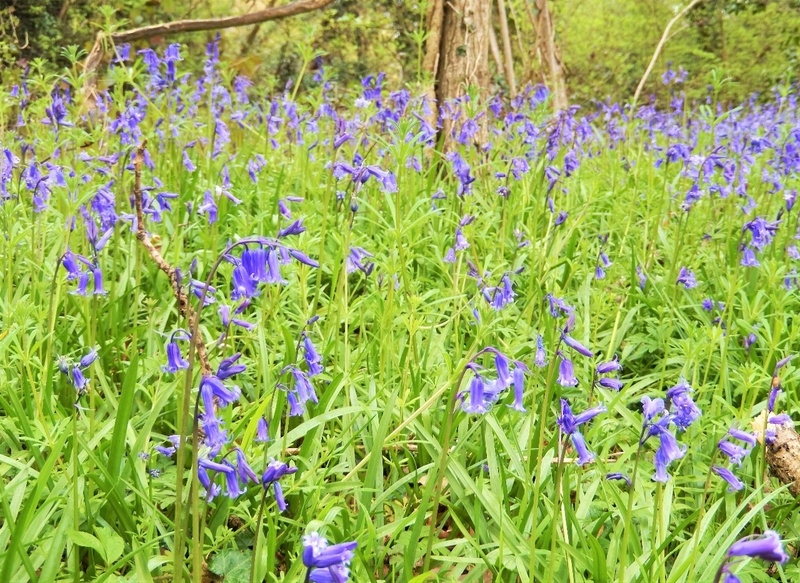 English Bluebells in the woods. The stems mainly arch over as the flowers are along one side, and the top of the stem is dark purple blue. 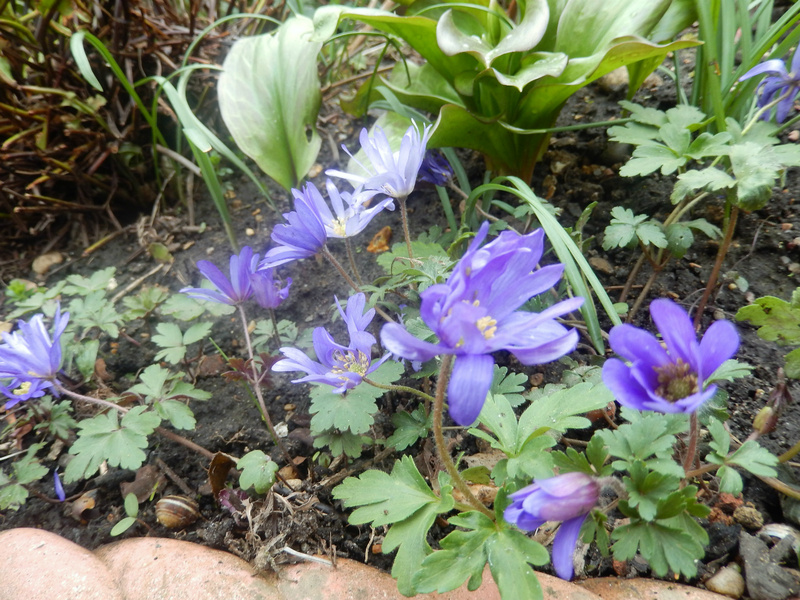 Each flower is a strong blue colour and a definite bell shape ... and they smell lovely! West KIngton Nurseries in Wiltshire held one of their twice-yearly open days last Saturday. 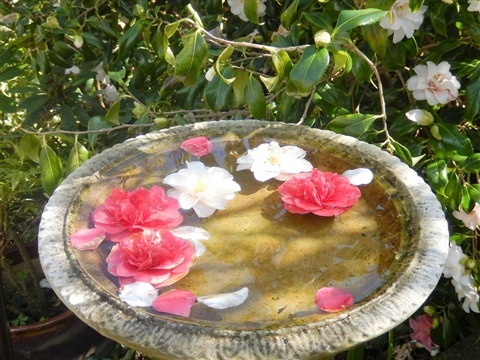 The proceeds of catalogue sales go to support local charities, and their plants are extremely competitively priced on these days. We met up with our daughter and her family for a good old browse and ended up buying more than we had planned, but nothing that dd not have a home to go to, which was nothing short of miraculous. New Heucheras will grace our garden pots, new colours of hollyhocks will joind the pink one at the plots, along with scented carnations and huge white daisies... even more to look forward to with anticipation! I also bought half a dozen savoy cabbage plants and some purple sprouted broccoli plants too... seems odd somehow having new plants while this season's are still producing masses of delicious spears! And I have remembered to take photographs of two more "recipe outcomes", which I really should have added in March, so I shall be doing this tomorrow: Parmesan Leek Bake, and Wild Garlic Pesto. And Apricot and Almond cake starts my April offerings. I shall try to keep up with these recipes month by month as originally planned. Hope you enjoy reading at them. The oak's golden Spring crown --- is it a dry Summer to follow? 18th April -- Nature's weather forecasts? then we are certainly in for a dry Summer! Our local oak trees are hanging out their golden leaves, whilst the ash trees are resolutely keeping theirs well hidden. The sight of the golden crown of the oaks across the valley in the sunshine today was glorious indeed. The photo does not do them justice!! I read a really interesting article in last month's Kitchen Garden magazine, which helped explain one of those folk lore forecasts I never properly understood: The Red Moon. After all, it is not even red at this time in the year!! It refers however to the omen of frosts and scorched young growth on plants - which can look red - during the first lunar month after Easter, which this year falls between 7th April and 5th May. On clear nights, so European folklore has it, the light of the moon falls onto leaves and shoots, with a neagtive effect, whereas on overcast nights the cloud cover protects them. Well.... I see what they mean. The last two nights have been clear and very, very frosty here. 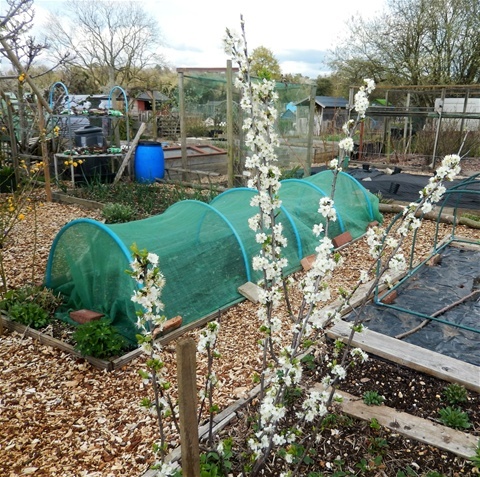 I even went to the plot and wrapped my little greengage tree in fleece, earthed up the potato shoots just poking through and put a little fleece tunnel over the precious french bean plants in the mini-tunnel as extra protection. And would you believe it? 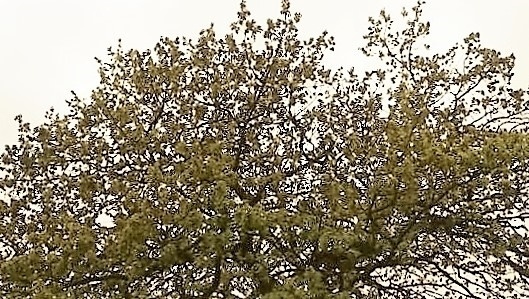 The cherry tree in the garden at home chose that exact day to unfurl its flower buds!!!! Argghhh!!! Another fleece and clothes pegs construction. MInd you, I don't see how this Red Moon stuff works when Eastertide can vary by up to a month. 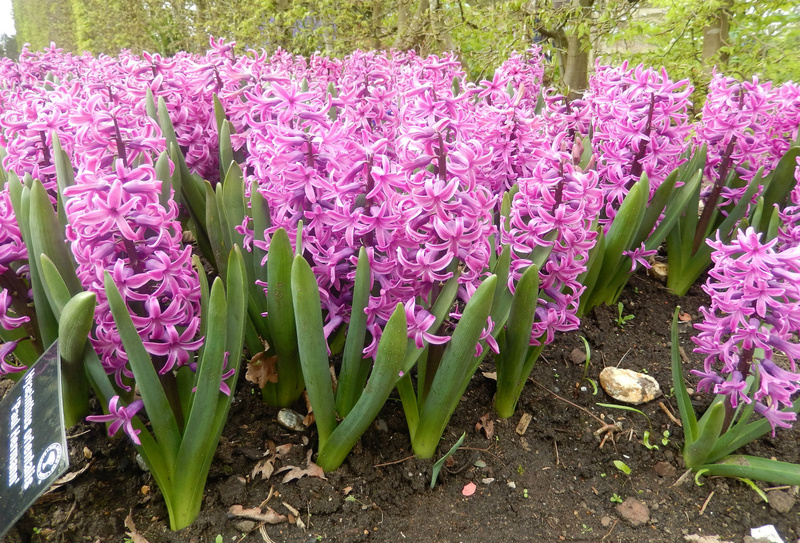 I suppose it is true more often than not, regardless as it would be an unusual April/May with no clear skies and resulting frosts. With me so far? Be warned, that is not all that is out there lurking. We also have the Saints of Ice to contend with as well: St Marmetus, St Pancras and St Servatius, with their feast days on 11th, 12th and 13th of May. They were originally supposed to protect crops from the last frosts of the year, which they seemed not to manage very well. 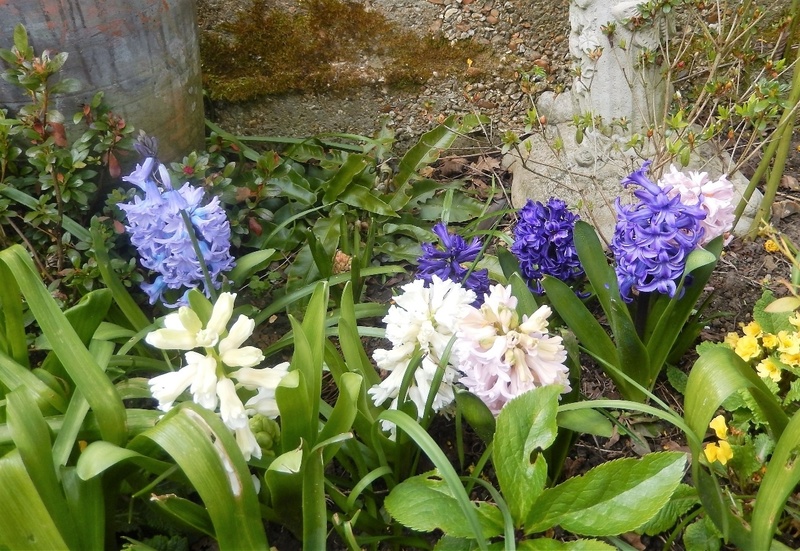 As a consequence, they became known as The Saints of Ice, and in many countries across Europe gardeners wait until after these dates before planting out anything tender. There has been lots of conflicting research about the accuracy of the last frosts falling on these dates ... I guess it depends where you live as to whether The Saint of Ice will arrive on their feast days or not! 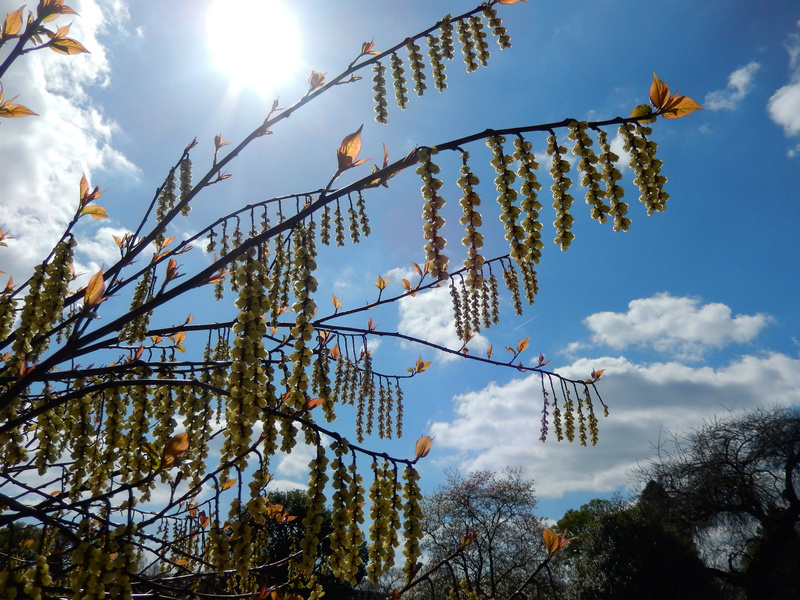 So moving on .. it has not all been doom and gloom and frosts this week. In fact, we have had torrential rain for two days as well as some welcome and glorious sunshine. Have you ever noticed how you can go to the plot with a nice "do-able" list, and events overtake you and the whole day morphs into something quite unexpected? Well Tuesday was one of those days for sure! 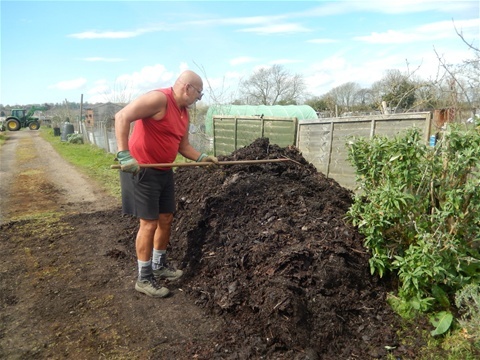 We started off with digging and weeding, when the man with the tractor arrived on site (He actually works for the council, he is not a random person) so I asked him if he could bring us some of he partly mulched leaves from the vast pile near the main gate. You know my love of leaf mould, so when he asked how many tractor bucketsful I would like, I rashly asked for four. We dashed about like things possessed, me to barrow the remainder of the exisitng leafmould onto the plots so it was not buried under the new leaf pile, and my OH Abi to put up the two old fence panels we had planned to use to stop the leaves from falling through the wire fence from the verge into #145. We finished just as the first load arrived, rather out of breath. Four bucketsful was a tad ambitious as it turned out: we stopped at three. As you can see from the picture that is still some serious leaf pile, alright. The driver was very skilled at placing it all just so, and in scraping up the spillage from the road way. Thank you, thank you, thank you!!! Abi then started moving the bits that had fallen into the adjacent flower bed, and I went off to get out the plastic sheeting.... when there was a shout of "Quick! Come here!" and there, lying on the road, was a grey mole. Not a black mole. A grey mole. It did look a bit dazed, poor thing. After all, what mole wouldn't be when, having been safely munching worms in a nice cosy leaf pile, your world turned upside down and you end up pitched out onto the roadway? It seemed uninjured, so I quickly took a photo and carefully transferred it to the grass verge opposite, where it burrowed its way under the long matted grass. You see, you never know what life is going to bring you next! 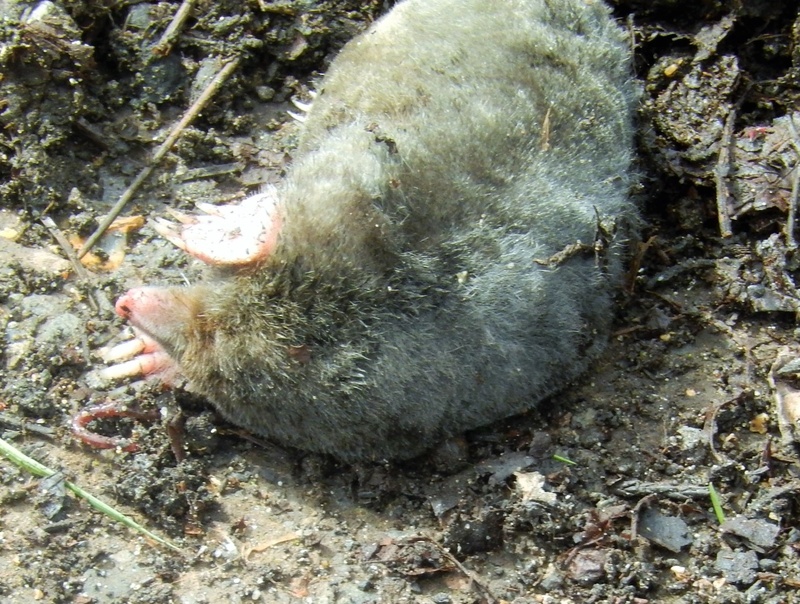 The hapless grey mole -- no moles were harmed in this episode! We have actually done lots of work this week, both on the plots and at home in the greenhouse too. Plot 145 now has a large flower bed dug out, planted up with dahlias and gladioli, as well as a Kiwi plant planted against the side of the metal shed, The peas sticks are in place --all we need now are the peas. They have germinated at home and I hope they grow really quickly as their new home is awaiting. The onions sets are all growing and the whole place is beginning to look much more "occupied"
Plot 146 has hardly a weed to be seen, at least not for long, not even in the front flower borders. For some reason however there are millions of weed seedlings popping up almost daily in amongst the onion sest, far more than on #145 and so I hoe them off every visit. Leaving them will affect the growth of the onions as they hate any sort of competition, so it is not just a cosmetic reason I want to move them on so quickly. 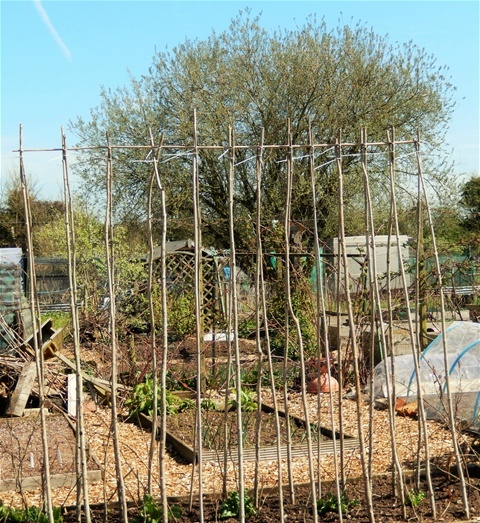 The beans sticks are up -- thank goodness for cable ties --- and now I see how many poles there are, I know how many runner beans to sow at home. I also spent a couple of hours sorting out our stash of canes, tying them into bundles that will be used for the climbing beans for drying, and likewise, now I can see how many of each type of these to sow too. I am looking forward to those Gigantes even more now, having seen Rick Stein cooking some on TV this week.,,.mmmmm. IT might seem like faffing around sorting canes like this, but it helps with planning ahead, so really it is time well spent in my book. I forgot to sow seeds of Calabrese, so bought some plants at a local Garden Centre. They had just been delivered and looked healthy enough, so seemed worth the money, especially given the price of a single head of calabrese. They are planted out under a debris netting tunnel now, although oddly , one sees to have vanished from the middle of the row. Vanished completely. No sign of it. A bit of a mystery, as there was no slug slime and a rabbit could not get in at all. No ideas left! 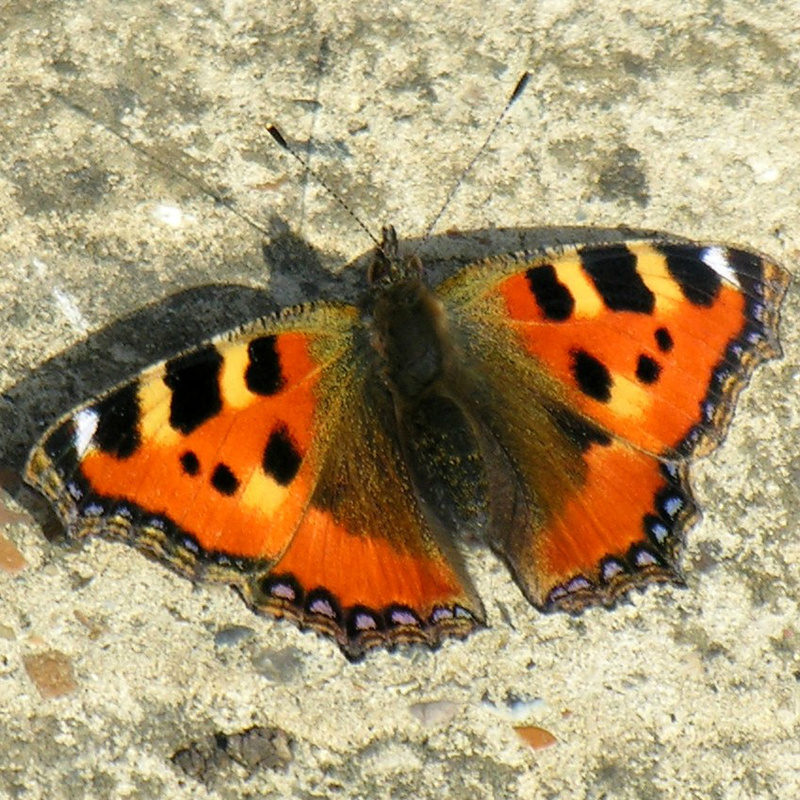 Small Tortoiseshell butterfly. 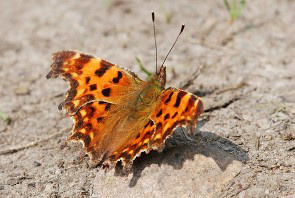 If you see two or more fluttering around each other they are not dancing--- they are fighting! 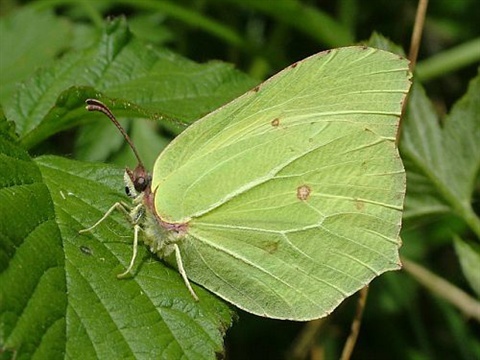 Brimstone butterfly.. the makes are the original yellow "Buuter-fly" but the females are more greeny white. 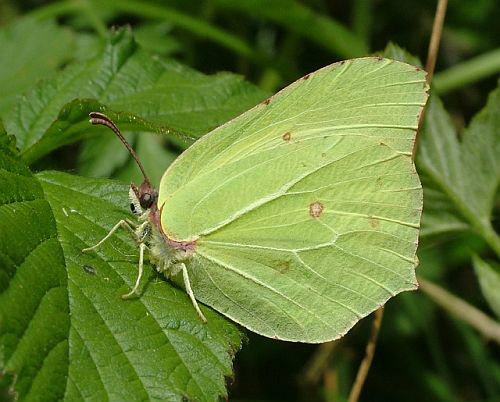 The red spot on their wings distinguishes them from white butterflies. 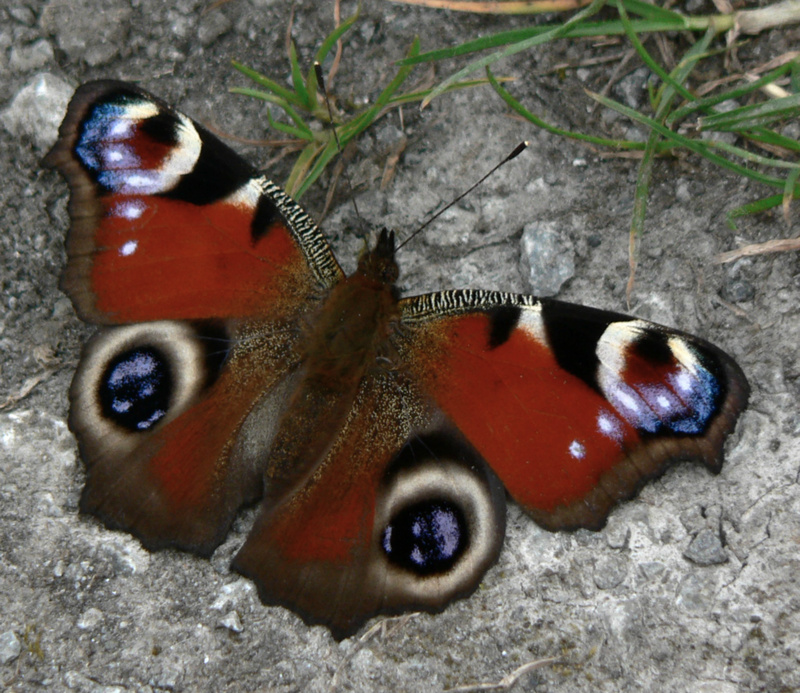 There have been lots of butterflies around this week, enjoying the flowers after a winter of hibernation. 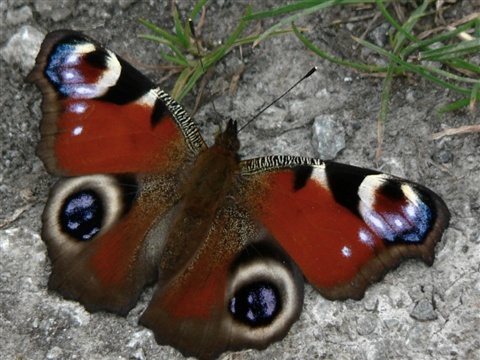 We are going to leave a large patch of nettles in the corner of #145 for the small tortoiseshells and peacocks, and as there is also jack-by-the-hedge in amongst it, the orange tip butterflies will appreciate this. 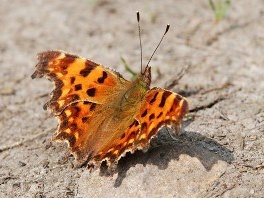 if painted ladies turn up, there is the odd thistle for them there too. 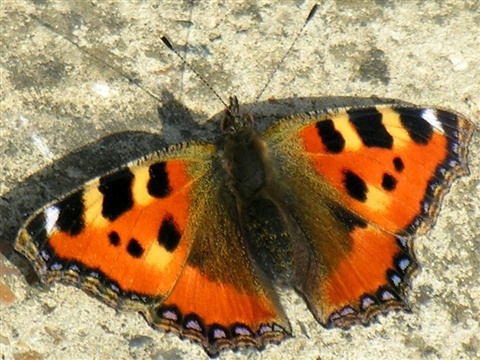 Last Summer we raised a lot of small tortoisehells at home (with some for my daughter too) as due to parasitisation numbers were reducing. Might be concidence but we do have a lot here right now! Small White butterfly-- every veg grower's favourite, not! Their eggs are laid singly and caterpillars are small and green. 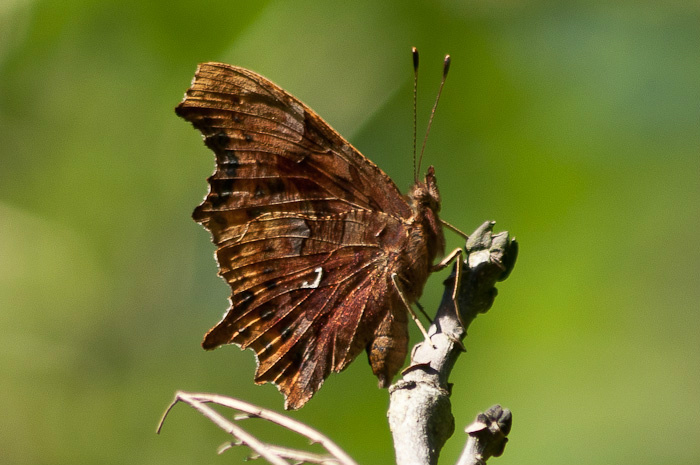 The adults can fold up their wings to get through netting so you need to use something with holes smaller than half an inch! 11th April - Red Alert! Red Alert!! 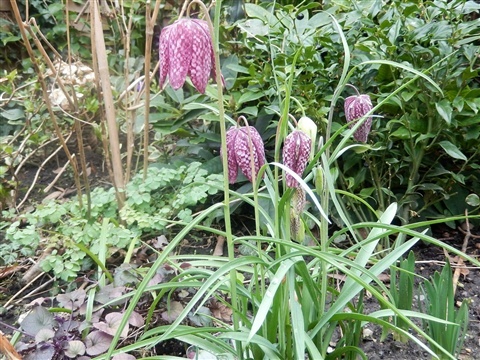 On Saturday on one of my trips around the garden I was thrilled to see that the lilies are poking their noses up through the soil, when there, sitting boldly in the sunshine, was a bright red Lily Beetle, the scourge of our lillies and fritillaries for the last few years. Beautiful they may be, but they wreak havoc by eating chunks out of the leaves and buds. 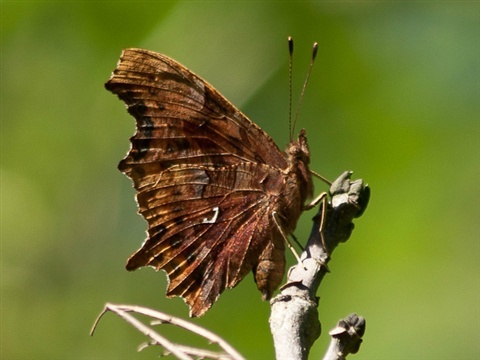 Their larvae, which have the unpleasant habit of covering themselves with their own faeces, live underneath the leaves, eating away and reducing them to little more than skeletons, which means that the plants give up any idea of flowering. 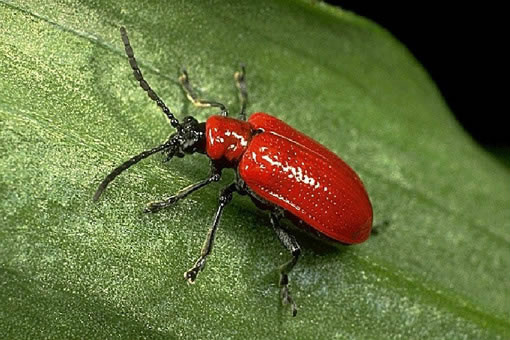 Every beetle we see we pick off and squash. Sometimes years we manage to prevent too much damage, but equally as often we miss some when we are out, and then have to deal with the larvae -yuck. From now on we shall be on high alert... you have been warned! It has been another busy week, with two more new beds dug out on #145. That makes three in one set and two in the second. The large flower bed would have been done today, but rain stopped play. We do need to get the space for planting out the dahlias sorted very soon, as they are starting to shoot under the staging in the greenhouse. They have multiplied hugely now, and coupled with a few new ones we absent-mindedly bought, they will need a lot of space. Some will go in #146 on the end of beds, but the majority will form a large cutting area. They are one of my favourite flowers and usually do us proud, with lots of bunches to share too. Our daughter maintains they harbour earwigs, which are her least favourite insect, so none go her way just in case! Cheap Lettuce Plants - earlier in the week I spotted a tray of cut & come again mixed lettuce in the supermarket for £1. 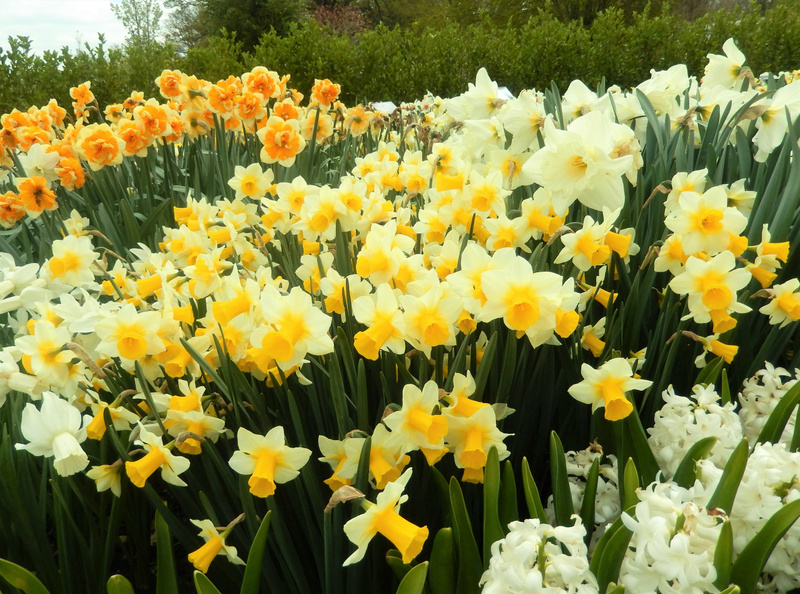 Once these were divided into generous clumps and planted out, it gave sixteen altogether. Sixteen mixed lettuces for £1, how good is that? Twelve of them are currently sheltering under a cloche with the vents open to harden them off a bit, whilst the others have had to take their chances. 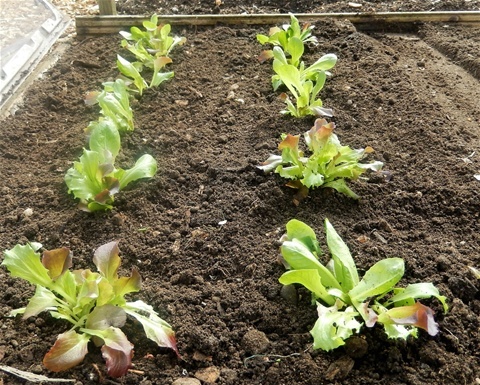 As the Tan Tan lettuce seed I sowed has failed, this will give us plenty of lettuces until I start off another batch of seed -- I shall be sticking to Little Gem next time. 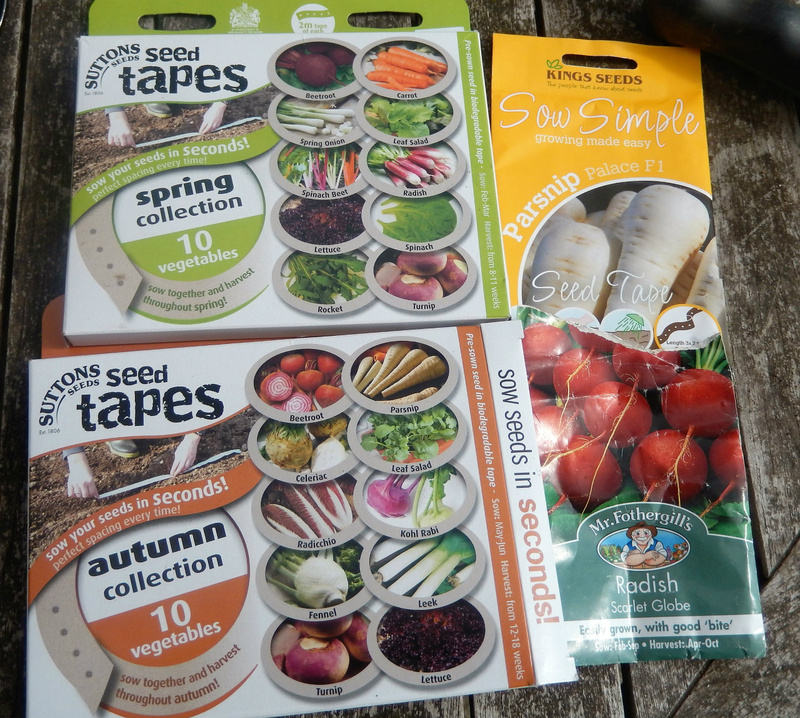 Seed Tapes: Suttons Seeds sent me two large packs of seed tapes absolutely free, and I had already also bought some seed tapes from Kings Seeds - parsnips and carrots. 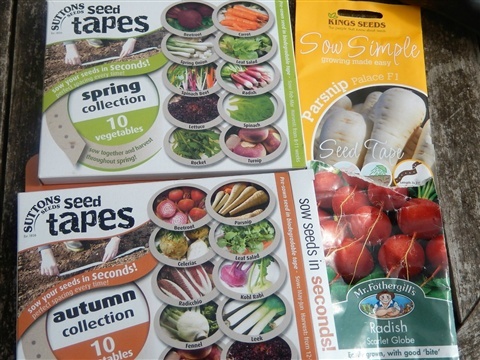 I have never used these tapes before, but for root vegetables in particular I always seem to sow too thickly and thin insufficiently, so the though of the spacing being predetermined had its attractions. 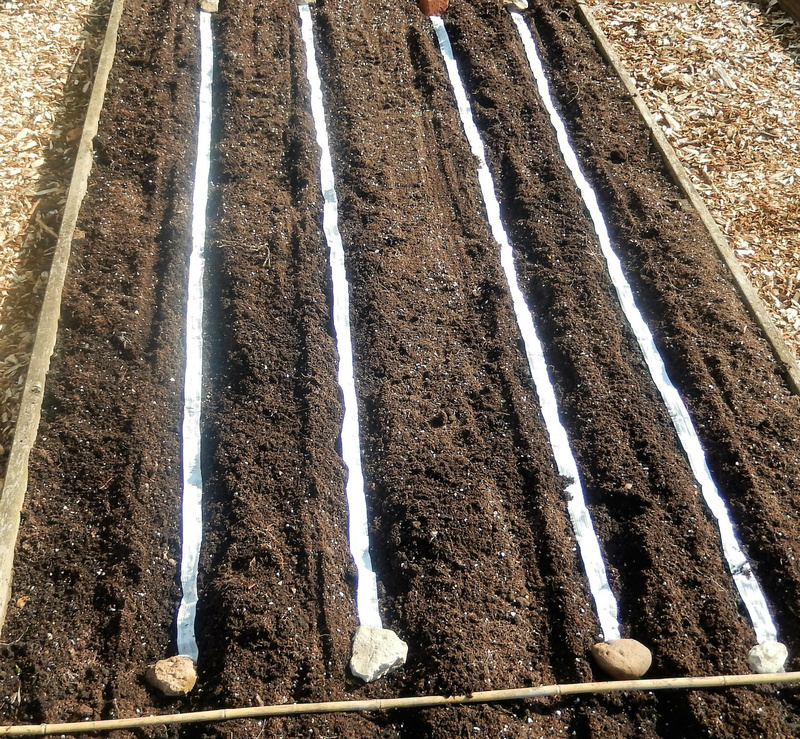 I measured the tapes out carefully and laid them in grooves in the soil, already watered as per instructions. What wasn't clear however was how much the wet paper would stretch, so my careful alignment ended up a bit off. I don't suppose it really matters. The parsnips from Kings Seeds are Palace, which I have grown before, but Suttons had substituted a variety called Lisbonnais, which is new to me. 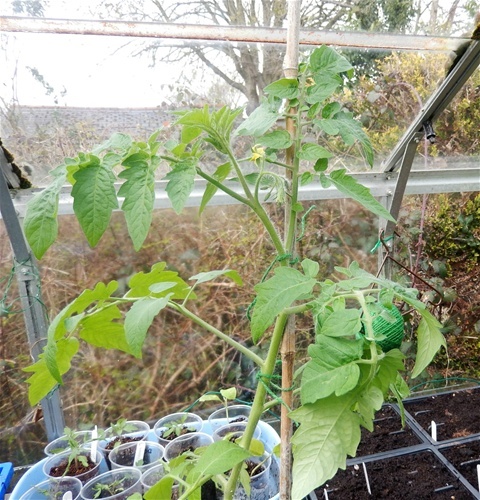 It'll be interesting to compare the two, being grown alongside each other, for flavour and size. I usually sow a few radish seeds along the drill to act as a place marker, as parsnips seem to germinate relatively slowly, but I didn't think to do this until after I had covered over the tapes. Rather than rather mess about, I sowed a row of radishes crosswise in the bed to mark the far end of the row, as past this I am planning to plant out some sunflowers. At the closer end are Calendula seeds already. The carrots are a variety called Sweet Candle from Kings Seeds, and Nantes 2 from Sutton. I hope these last will give some early little carrots, The Autumn Kings can go in to follow the lettuce plants. The carrot bed is covered with enviromesh supported by blue water pipe hoops, as without this protection, carrot fly grubs infest the developing roots and then they are inedible. 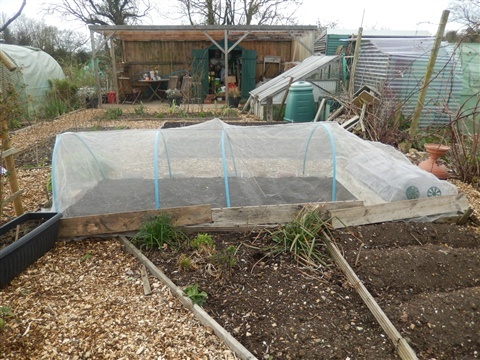 After years of attempting to repel this pest by planting onions etc alongside the carrots to confuse the flies with their smell, the only way I can grow decent, edible carrots is under the cover of this extra fine netting. It might not be pretty but it is effective. I might have to resort to using it over the leeks later in the year too, after last year's leek moth attack. It has been a bit of a week for carrot sowing: this morning I helped Rowan aged three sow one of her Christmas presents - some Paris Marketmore carrots, in a large pot in her garden. It was part of a Peter Rabbit themed present from her auntie, and she has been bursting to sow these seeds for weeks. As I had the tapes, I have also put in some Kohl Rabi, which I have never successfully grown so far, and some Purple Top Milan Turnips, both in the brassica bed. The remainder of that space will be filled with summer cabbages, which will be planted out once they are large enough. They are currently at home waiting to be pricked out into individual pots. 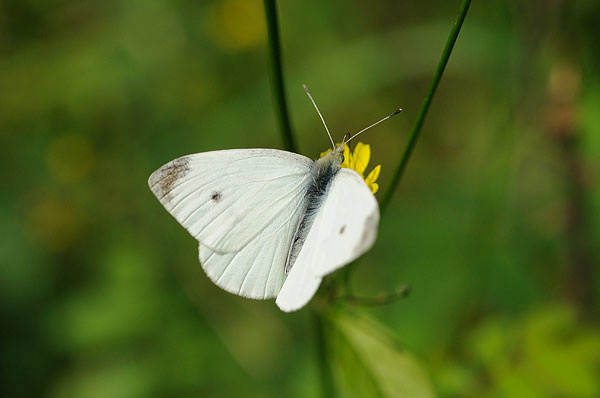 Must keep them safe from the attentions of the white butterflies which are beginning to appear. 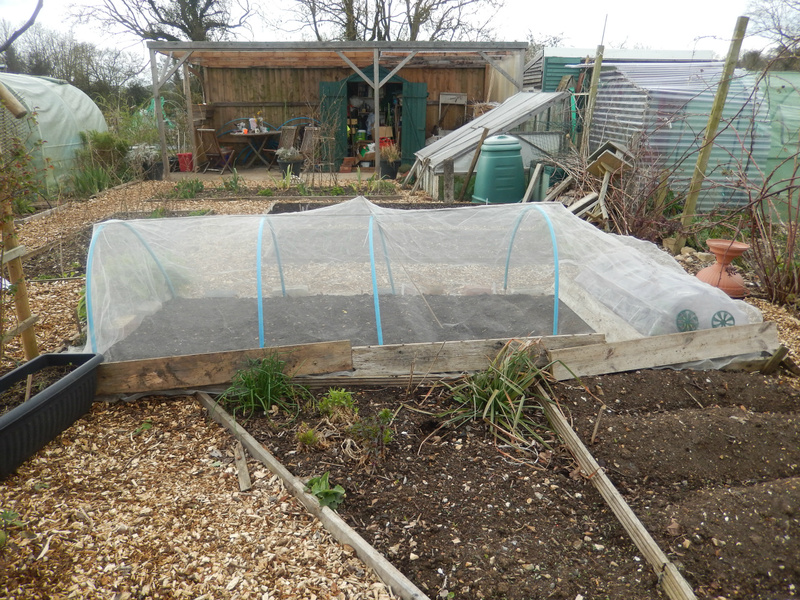 The enviromesh cover for the carrot bed, stretching right across the cloche with the lettuces under it. That way I know it will be long enough when the last lot of carrots are sown later once the lettuces have been eaten. Each of the seed tapes from Suttons was 2m long, whilst the single variety packet from KIngs Seeds had 6m of tape. This gave enough for a whole bed of parsnips. Direct sowing peas or beans on our plot is just a way of feeding the local mice, voles and rats with delicious seeds, so I now always sow them in modules at home and plant them out once their roots fill the space. Luckily we don't grow half a plot full of peas or this would not be at all practical! With more space this year though, there will certainly be more than in the past, so this Sunday, a bt later in the year than usual, I sowed a range of peas to eat from the pod .. Tall Purple Podded, Champion of England, Telefono, plus the shorter Latif D'Annonay, Stokesly Pea and Parsley Leaved Pea. 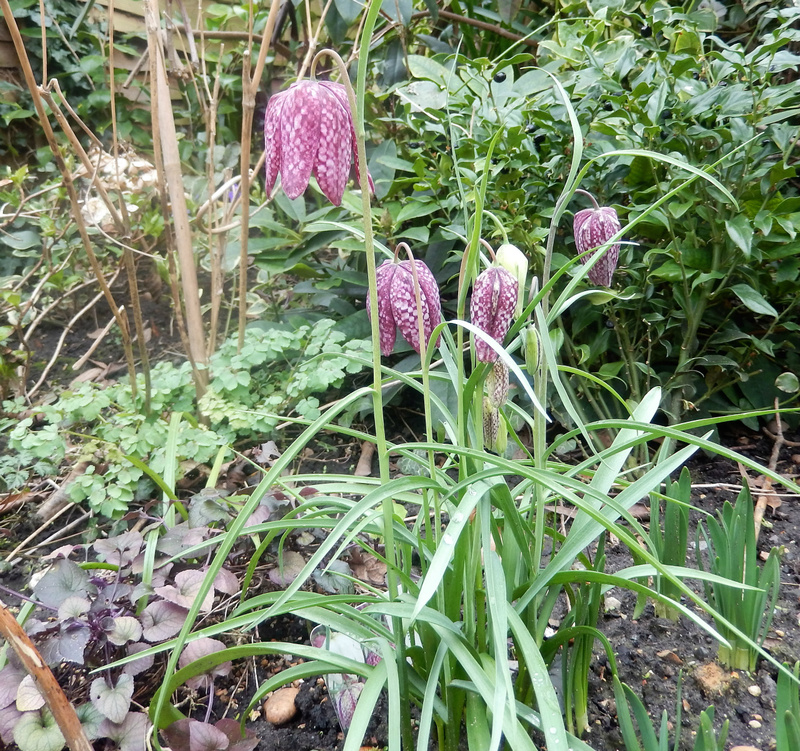 These three shorter ones are new, from the Seed Circle I belonged to last season, so I shall be interested to see how they fare. I shall keep you posted! 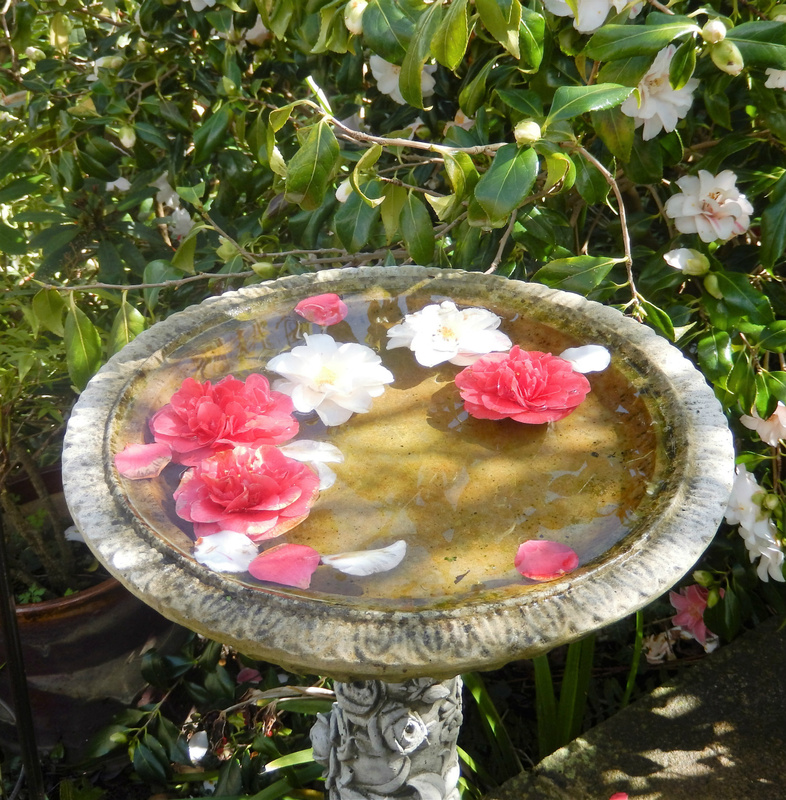 We always know when the grandchildren have visited ... things like this appear in the birdbath!! Break open the tomato fertiliser, someone. Flowers have arrived!!! Tomato news: Remember those tomato plants I was given for my birthday back in February? They have been potted on several times, I have taken all the bubble plastic insulation out of the greenhouse to try to give them as much light as possible... and look what I saw when I was tying them to support sticks --- flowers!!! And the plant that snapped grew a good array of roots in its jam jar of water, and is now potted up. It will be a bit delayed but that is no bad thing. Time to sow the ones that will be grown outside this week! Chook Babes Update: I nearly forgot!! 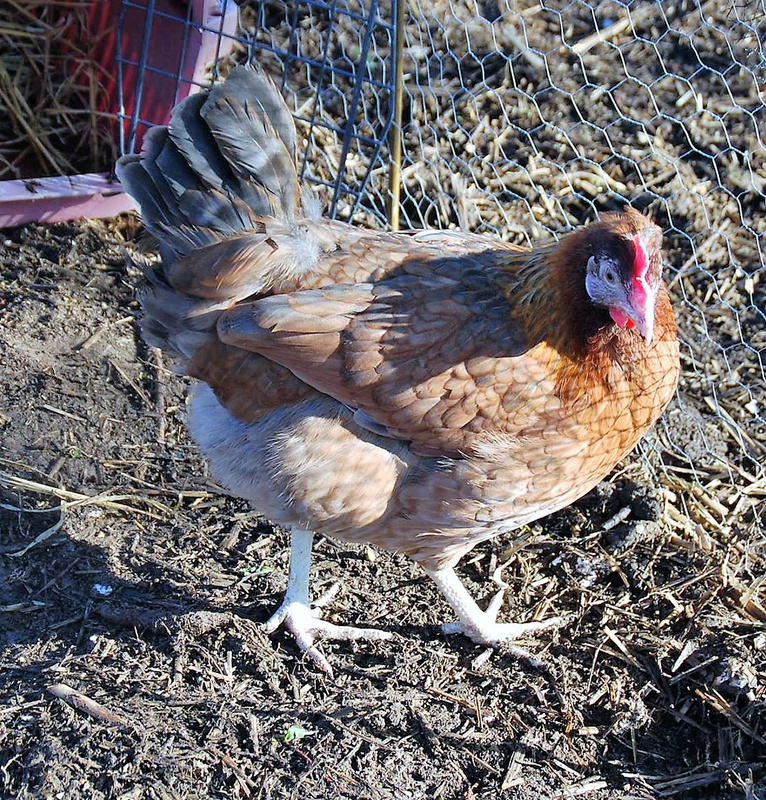 Two layers now, so a brown egg (Rudi) and a white egg (Trixie) most days now ---oooohhh!!!! I sent them the rest of the pea shoots growing in the tray, and a huge bundle of kale too. That should cheer them on their way I hope, to even more eggies! Plus they also have an extra nest box now, so they can all lay at the same time if they have to.. what more could they possibly ask for? 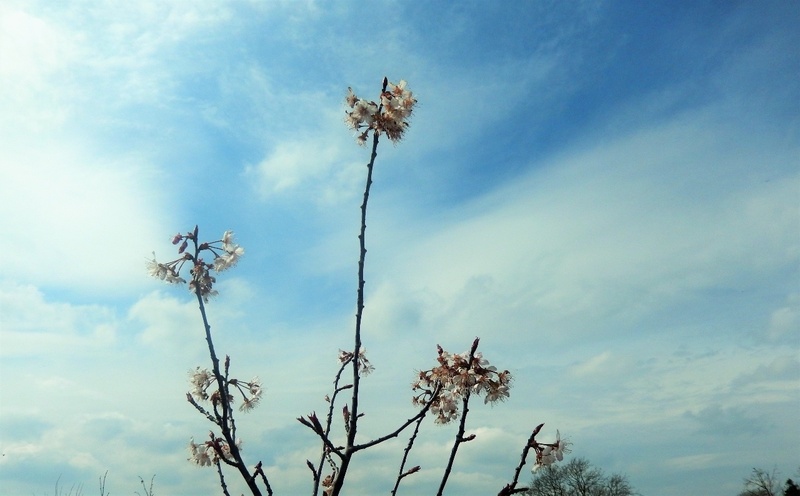 Cherry blossom and a blue sky ..... beautiful! 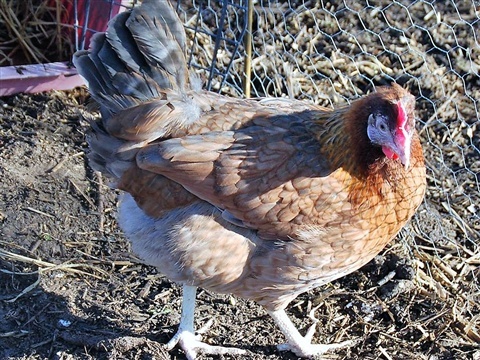 3rd April - MORE Chook Babes!!! We have returned safe and sound from sunnier climes, and guess what? 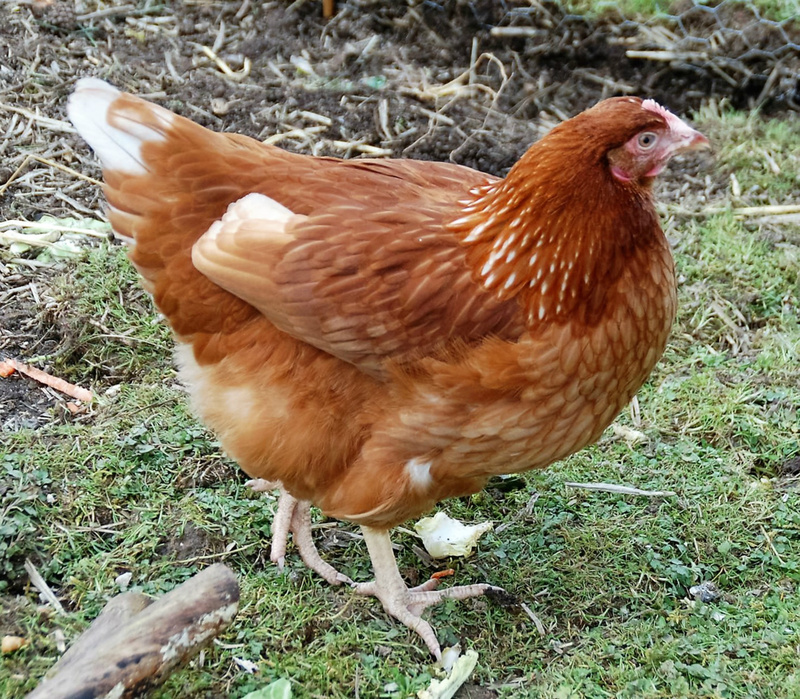 Our daughter and son-in-law decided that they both also needed a chook to call their own, so, without further ado, I introduce the two new girls to their flock. Mind you, they are clearly a bad influence as the girls now know how to leap/fly out over the top of thier enclosure and play in the garden. 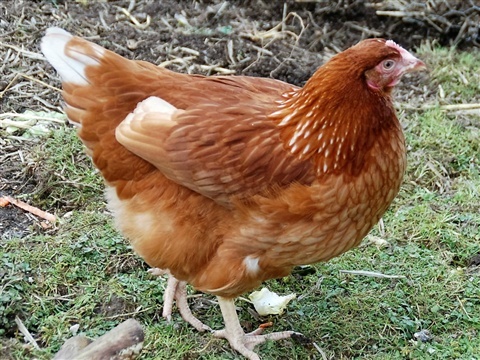 All part of the chicken-keepers' learning curve! 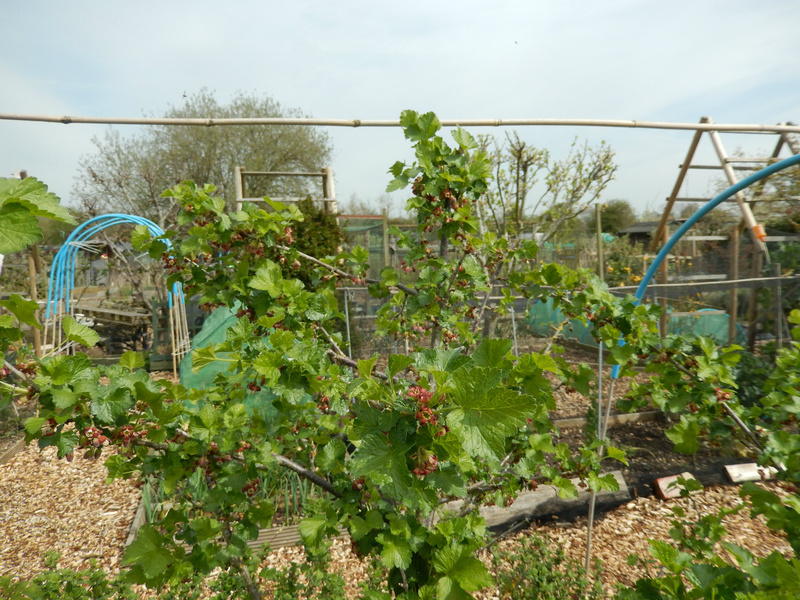 Fortunately Katie did no real damage either at home or at the plots, although this morning I did spot a large green polytunnel cover in the trees backing onto the water meadow, so we were grateful our little one was still standing. The radishes I sowed just before our holiday have germinataed. Nothing like a nice neat row of seedlings to make you feel good! The Spring Onions in there are bulking up a bit but I decided they are too small to harvest yet. Back at home, the plants in the greenhouse seem to have doubled in size in a week. 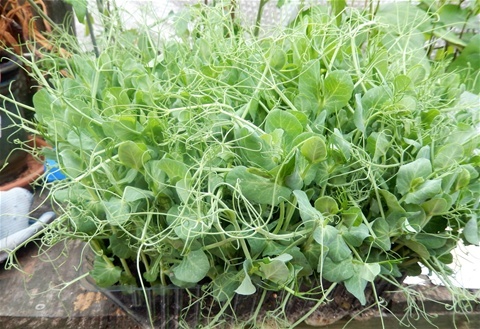 The pea seeds I sowed two weeks ago have formed a mass of delicious tender shoots ready to eat, and those tomato plants I potted on a week ago, well they are massive now. I shall have to take the bubble insulation out soon as they are starting to get a bit drawn. I had an accident with one of the Golden Sunrise plants on the day we left and the stem snapped, so I put the wilted plant in a jar of water and now... roots have grown and it looks as though it will make a healthy plant after all. A couple of years ago I rooted a few side shoots from the cordon tomatoes I grew, and they gave me some later fruiting plants, so this is definitely worth bearing in mind. Free plants, after all! Last year I found a way of growing chillies, peppers, aubergines and tomatoes that enables the plants to grow a really healthy root system. 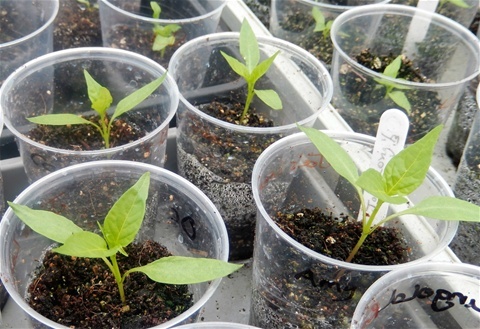 The seedlings are transplanted as soon as a proper leaf can be seen, into transparent plastic cups, with about 5cm or so of compost mix in the bottom. The mix is made up of a third coir compost, a third vermiculate and a third of multipurpose compost, which gives a light, free draining substrate which gives roots plenty of air. Every other watering, they get a very weak solution of seaweed based fertiliser, and once the leaves reach the top of the cup, more substrate is carefully added, up to the level of the lowest leaf. This can be repeated until the cup is full of substrate. Further roots develop along the buried stem, so by the time the plants are ready to move into larger pots (and the root growth can be easily seen through the sides of the cup) they have a large rootball. Last year I managed to grow aubergines with huge fruit on them, so I am sticking with this method again this year. Lots of new flowers out in the garden now, looking very pretty. 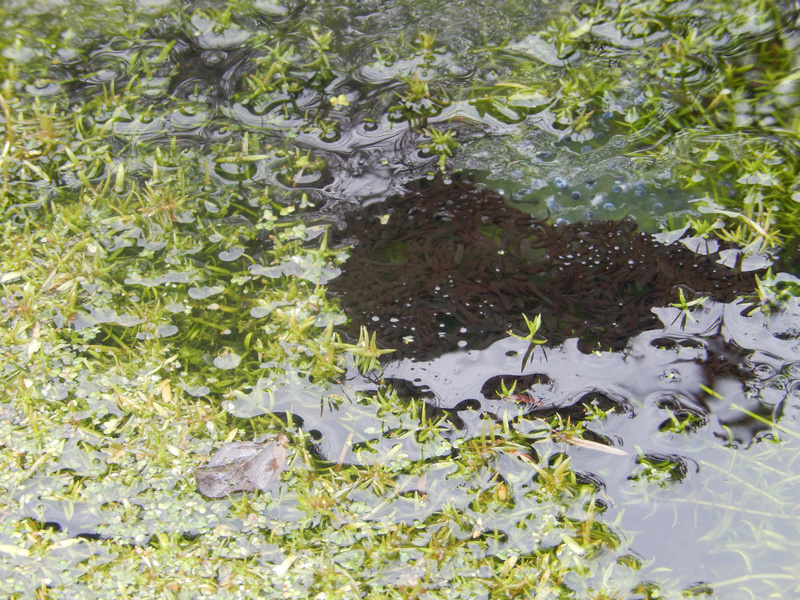 And the frogspawn has hatched, into a seething mass of black tadpoles. Black birds are eyeing these up, trying to work out how to get to them without getting their feet too wet!